Cpick is a small but quite powerful program to get colors from your screen with the build in magnifier. It can copy colors as Hex, Decimal, RGB or HSV value as well as copy the screen behind the magnifier to the clipboard as Bitmap. The ‘Click and Drag’ feature which will give you the color code of anything in your screen be it from an image or another web page or your desktop. 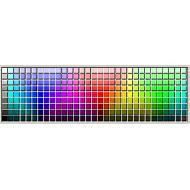 The color bar that show your selected color and web safe color alternatives is very useful. Cpick is a fast and efficient free program. After picking a color from any object on the screen it can be stored on it’s clipboard in several formats (hex, decimal, RGB, etc.) for later use. You can maintain your own color lists, create CSS style sheets and more. There are some other unique features.